Our worship is full of contrasts this Sunday. We recall Jesus’ entry into Jerusalem on Palm Sunday, with its pomp and pageantry. Then we plunge into the Passion, which ends with Jesus’ burial. Throughout Jesus’ Passion, many voices were raised to oppose Him. But only one voice, Jesus’, calls us to look beyond the seeming tragedy of His death on the cross. 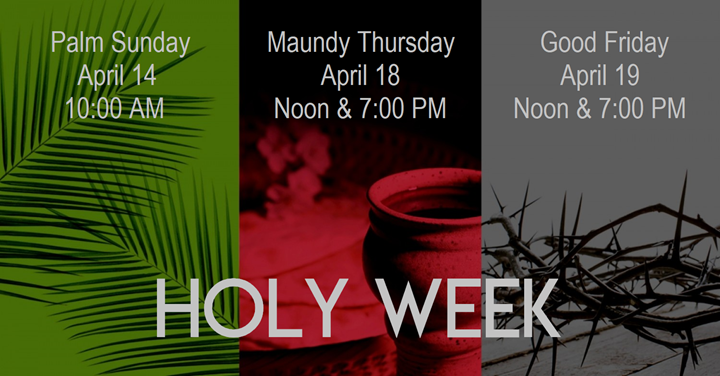 As we recall our Lord’s Passion, we also anticipate joining those who sing “Hosanna” in eternity! In our worship, we remember that on the night in which He was betrayed, Jesus instituted the Lord’s Supper, and He said the cup is “the new covenant in My blood.” God remembers His steadfast love and, for Jesus’ sake, forgets our sins. When we receive His body and blood, we remember and proclaim His death. We will gather in Worship to remember what Jesus does for us and celebrate the blessings that come to us in the Sacrament… forgiveness of sins, life, and salvation. In our worship, we are remembering our Lord’s suffering and death. We remember that Jesus did this for us. To remember means to bring something to mind so that the past may have an effect on us today. It is only because of Good Friday, that Jesus also rose in our place, leading the way to God’s presence forever. This is why we remember that Jesus truly makes our salvation sure.